Even though I personally LOVE doing the grocery shopping (I know this is weird), it drives me nuts that the produce section can be so overwhelming. Besides keeping fruit around ALL THE TIME for Havi (I seriously think this kid eats like a teenager), we’ve also been buying more produce for Whole30 compliant or paleo dinners lately, so it seems like I’m spending a lot of time in the produce department these days! 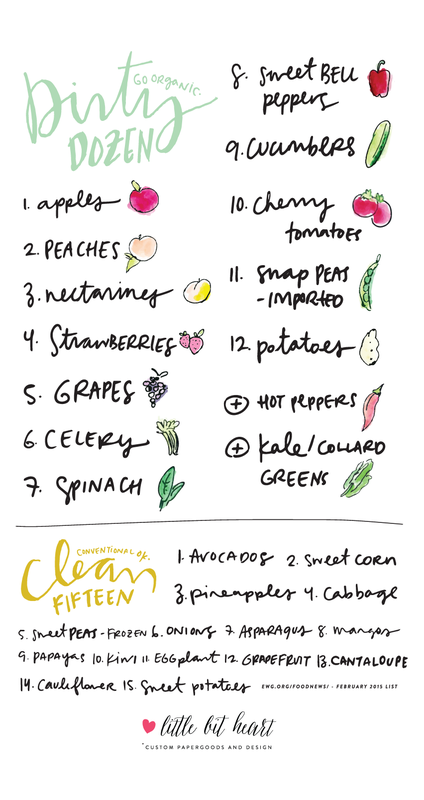 Trying to choose just right fruits and vegetables is one thing- I pick them up to examine and I pretend I know what I’m looking for ha- but my biggest worry is figuring out what’s best to buy organic, and what to skip. That’s where Environmental Working Group’s Shopper’s Guide to Pesticides in Produce™ comes in: this list highlights the “Dirty Dozen” (go organic) and the “Clean Fifteen” (conventional’s ok) fruits and vegetables, and really helps you figure out where it’s most worth it to spend more for the organic versions if you want to do that. 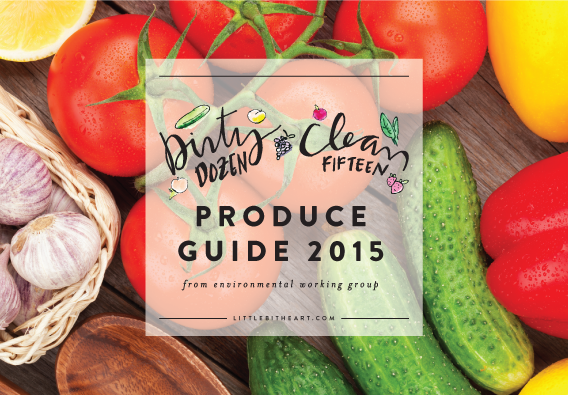 They just updated the list for 2015, so we’ve updated our free printable of the produce guide (available here) as well! We didn’t notice any major updates from last year’s list, but we couldn’t resist the chance to do a new design since we look all this on the fridge all year :) I know I’m always taking screen grabs and pictures of things I want to remember, so we also included a version (available here) that you can use as your phone wallpaper or save to your photos so it’s always handy.